The Champagne Records version is here: https://www.discogs.com/Various-Re-Mixture/release/580398 and more words. "There are certain records that 'split the atom', creating a totally new sound – serendipitous moments in time when an artist pulls a rabbit from the hat and forecasts a change ahead. This is the sort of musical alchemy mustered up by Radio London reggae presenter Tony Williams when, in 1980, he produced ‘Love Money’, his first attempt at a dance track, inspired by two then recent hits — the Sugarhill Gang’s ‘Rapper’s Delight’ and Dennis Brown’s ‘Money In My Pocket’. The twist was that he did this track with reggae musicians, inadvertently creating a hybrid sound in the process — it was funk, but not as we knew it, its dub sensibility setting it apart. 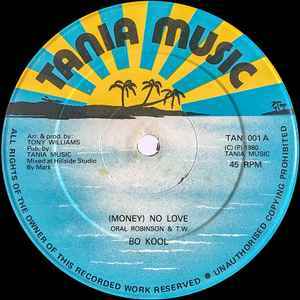 The vocal side, which, to the best of my knowledge is the first example of a rap on a British release, was called ‘Money (No Love)’ and credited to Bo Kool, whilst over on the flip was the instrumental version, ‘Love Money’ by T.W. Funk Masters. The UK jazz-funk scene was then in full swing, and this became a big underground tune, which went bigger still when the following year another, even more dynamic version of ‘Love Money’ was made available on the Champagne label. I’d later come to learn that ‘Love Money’ in its various guises would also become a classic underground tune in New York and then in Chicago, and is included in both The Loft and Paradise Garage’s top 100 lists. Fast-forward to 2004 and I’m reading a selection of 12 tracks picked by Master At Work, Louie Vega, in Wax Poetics. ‘Money (No Love)’ is included, but it’s a case of mistaken identity — the magazine under the impression that the Tony Williams behind this record was the American jazz-drummer. I mentioned this to Wax Poetics’ Andrew Mason, and he rectified the error in an article based around an interview I did with the real T.W. The incredible part of the story is that Williams had absolutely no idea that he’d been responsible for such a momentous record, inspiring New York DJs towards a more dub-based approach to their production and remixes, changing the parameters of dance music in the process. Only last year, during a panel discussion on edit /remix culture at London’s ICA, François Kevorkian confirmed that this was the catalyst record for his dub leanings, his next mix, of D-Train’s ‘You’re The One For Me’, starting the ball rolling in 1981. ‘Love Money’ would later be referenced in 1986 in the Larry Levan-mixed ‘Love Honey, Love Heartache’ by Man Friday."